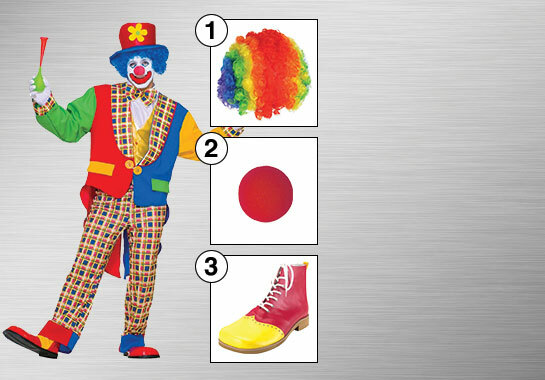 Make a colorful character for a night of fun, or get the perfect scary Halloween look with a dark and dangerous costume when you shop for Clowns and Circus Costumes! There are tons of cool looks for kids and adults, and they're all great for going to costume parties or trick-or-treating! In the world of entertainment, the clown’s history is as storied and rich as any other character. Whether good or bad, happy or sad, clowns personify the range of human emotion in one singular disguise. Since the dawn of theater, clowns have been portrayed as the lovable fool to the sinister soul and everything in between. Here at BuyCostumes, we have everything you need to turn that frown upside down and transform yourself into whichever prankster persona fits your style. 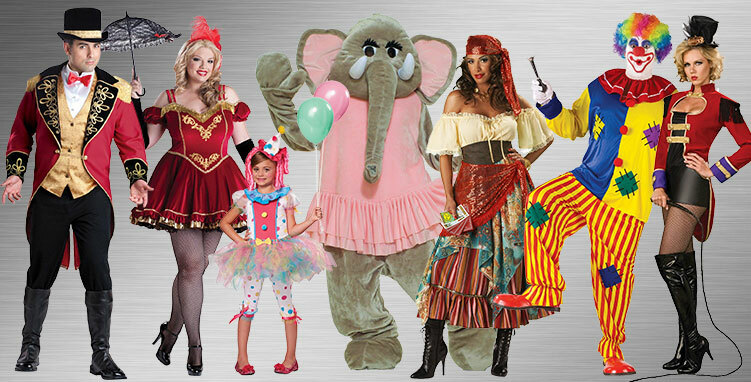 From classic to creepy, quirky to rainbow, these amazing costumes will let you take center stage and steal the show. Which Type of Clown Are You? For the love of Bozo, do NOT send in this clown. 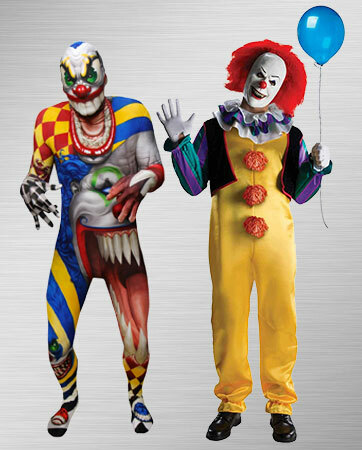 The Monster Collection Adult Creepy Clown Morphsuit is the perfect costume to scare the bejeezus out of pretty much anyone. This costume comes with the full-body jumpsuit and a zippered back closure. Soiled underpants sold separately. Come one, come all! Clowns offer valuable vignettes of laughs and entertainment while the other circus performers prepare the next act. 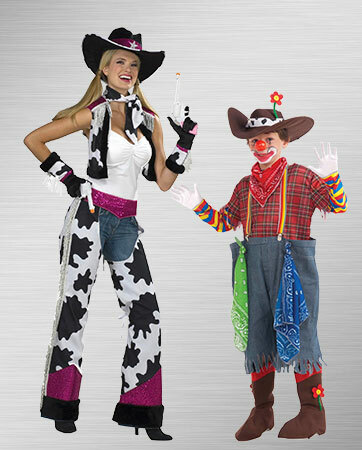 With the Big Top Clown Adult Costume, you can, too! It comes with colorful patched top, red collar and striped baggy pants. It's sure to make you the life of the party. Dressed to the 9’s and feelin’ fine! 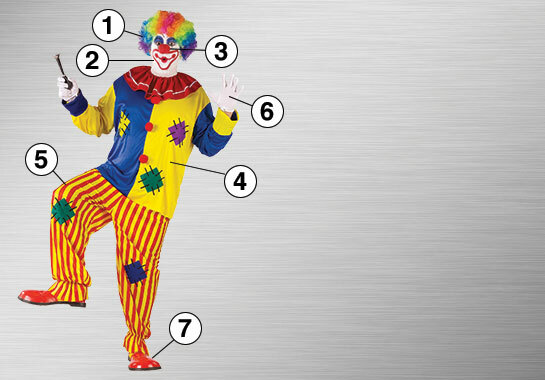 The Clown on the Town Adult Costume comes complete with baggy pants, top hat and tails, and it is just the costume for the fancier fool. There’s even a bow tie for those who wish to make a funny first impression. Those who say clowning is best left to adults have not seen this colorful costume. 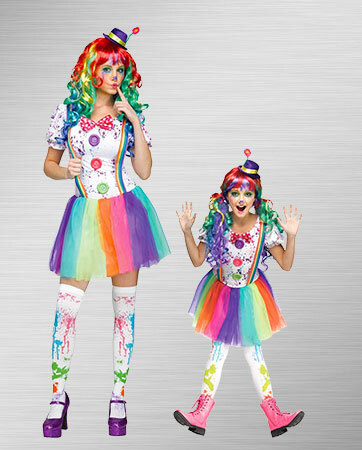 The amusing Kids Crazy Color Clown Costume comes with a multi-colored dress, footless tights and mini hat. Better buy some shades, too, because this costume will have you shining bright. Step right this way, boys and girls! The Female Clown Adult Costume is bold and super fun. This costume comes with the satin dress, tall striped stockings, tiny hat, bloomers and kooky bow tie to perfectly capture the fun-natured prankster within. Whoever said clowns are scary clearly hasn’t seen this costume. The Clown Girl Toddler Costume is silly, sweet and totally adorable. It comes complete with the polka-dotted dress, red bloomers and hat. When this little lady takes the stage, there will be smiles all around. “The only thing we have to fear is fear itself…and evil clowns.” – Unknown. This combo is terrifying with a capital "T." The Creepy Clown Morphsuit and Stephen King’s IT Pennywise costume duo will scare…well, pretty much everyone. Aside from the balloon and shoes, these terrible two come with everything shown. I hope you brought your shades because it’s getting bright in here! 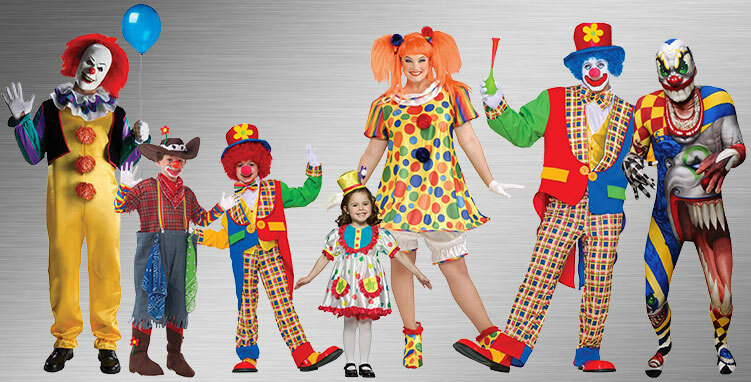 The Crazy Color Clown adult and kids' costumes create a fun way for you and your little clown to match. Both include the multi-colored skirt and suspenders, offering the perfect way to bond your way to the bash.